He allowed her to borrow his comics. “Don’t spill anything on ’em. And don’t draw on ‘em. Bring ‘em back when you’re done. Don’t tell Mama about the ones on the bottom.” Jessie only gave her those instructions once. Lacy knew her big brother Jessie, at fourteen, barely acknowledged the existence of a ten-year-old sister. She, in turn, idolized him so she never pushed past the boundaries so firmly set. She knocked before entering his room, even when she knew he wasn’t there. Like God, she believed her brother knew everything and knocking first was Law in his world. In his room the bookshelves ran floor to ceiling, and he’d built them himself. They were mostly scrapwood he refused to let her paint, though she’d offered wistfully during the evenings he’s spent hammering and cursing. Their mother worked at the hospital in the evenings, so she didn’t know about the shelves until they were a part of his room. He’d proudly displayed them to show her how he could help in other parts of the house, like the broken porch rail. Lacey had been gleeful at the thought of her mother’s happy surprise, had helped stuff his books and comics and boyhood paraphernalia into her own closet-sized room. They’d scrubbed his room spotless, made the bed (she couldn’t remember ever seeing it that way before) and waited up for their mother’s return Saturday night, a year ago. His mother had stared, speechless, at the tiny room made smaller by bookshelves that covered every wall save the length of his single bed. Now, Lacey sat on the floor and started sifting through a new stack of comics. She looked up at the shelves, sorry that Jessie hadn’t let her paint them. Maybe it would have helped. “I offered to paint them,” Lacey blurted and stopped. She looked at the floor, as Jessie’s eyes flashed at her. She knew she was only a girl and ten. Jessie was supposed to take care of her and that meant she didn’t help make anything. “Jessie… we rent this house. We can’t build anything onto it. You’ve attached the shelves to the walls. Mr. Garner may or may not like them, but that isn’t the point. This isn’t our house…” her voice trailed away and she put one dry hand on Jessie’s shoulder. He flinched and moved away. His jaw set and his lips flattened together. He shoved his hand into the pockets of his jeans. Lacey wished she hadn’t said anything about the paint. She loved the colors of the wood. Jessie had used different wood, whatever Mr. Jackson gave him – pine, maple, even one shelf of cherry. A year later, Lacey gathered up an armful of her brother’s favorites – Fantastic Four, Superman, Batman – and sneaked a peek at ones on the bottom. Mostly naked girls. She crinkled her nose. She moved to stand and dropped the stack, slick magazines sliding everywhere, under the single bed. Under the bed. She didn’t have to be told not to go there. Now, she snaked her hand far enough to grasp the edge of her Batman comic. And out dropped a small box. Small enough to fit in a pocket. She picked it up and pulled the top off without thinking. Tiny dice rolled out. At ten, a voracious reader and listener, she knew the dice meant only one thing. Jessie was running down the same path that had claimed the life of their Daddy. She knew the dice in the box must have appeared when Jessie’s attempts to improve the house were rebuffed. The house that wasn’t their house. She picked up the little box and pushed it into the pocket of her jeans, gathered up the comics and left, carefully closing the door behind her. She knew he’d never ask her for it – she knew in the way she knew her mother would never look through Jessie’s comics. Lacey felt the subtle shift in her world, the way it had shifted when her Daddy decided he didn’t want to be her Daddy anymore. She knew it had something to do with the little dice. Maybe she could figure it out if she held on to the talisman, the dice, long enough. An exploration of personal fear. You must choose the one thing you can’t live without, the Universe whispered in my sleeping mind. One thing? I answered. How can it be one thing? Should I hold out my hands and name them? They hold the pencil, the brush, the needle, the knife that make my art. How could I bear to make no art? You could learn to manipulate different tools, explore new mediums that require a different dexterity, the Universe mused. Right, I answered, but what if I say my vision? How could I bear to live without color? without looking into the eyes of those that see inside me, my truest friends? How could I give up my sight? You would still see all the colors in your mind, your memory. You could feel the warmth of your friends’ love even before they speak. You know what is behind their gaze just as they know what is behind yours. My ears? To never hear the ocean’s songs, the soft brush of the breeze, a blue jay calling, laughter, Beethoven’s Ode to Joy, my name whispered by a lover. No, I couldn’t. Again – all those experiences are rooted in your memory, to call up and enjoy as you please. Oh, no – not my memory- you wouldn’t take that. I would have nothing, no soul, no joy, no purpose. You have named it, the Universe chuckled, but I don’t believe you know it true yet. I felt the indigo blanket soft and warm and gently crushing colors blurred and ran to a brown sameness, echos of voices and laughter rose and fell until there was no meaning, until finally there was nothing, a velvet void. I floated. A softness, like a whisper, wrapped around my throat. The whisper faded, sliding down my throat, over my heart and I felt it move away, its echo growing fainter. I walked the long, isolated stretch of beach early one morning before the couples hand-in-hand, or young families eager to explore the limitless playground. Just me, sandpipers and gulls. My bare toes gripped the sand. The tide, quirky and cold washed over my feet, leaving beige sea-foam on my ankles. By the time I returned, I’d picked up a shopping bag full of shell pieces, yellow and ochre and pink conch worn by the sand and water. I like the remnants best. Perfect shells are beautiful and make intriguing subjects to draw and paint. But I always feel guilty, wondering if the animal that lived there died to give up that perfect shell into the hands of divers who sell to tourists. The shells I find on the beach, the ones Nature has deposited at the edge of the Ocean, broken and worn and empty, seem more of a gift, something to remind me of the beauty and capriciousness of the natural world. It occurred to me as I laid them on the deck railing to dry that we are like those remnants. 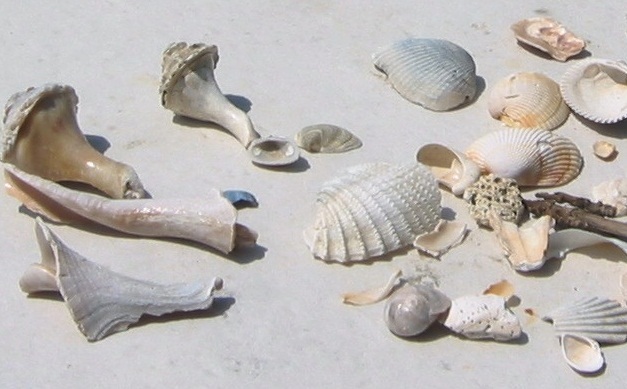 The color and form are unique to each shell, the result of its individual journey. Like all of us. We may start from the same place – or seemingly similar circumstances – but by the time we find a resting place on the beaches of our lives we are unique. Broken and re-shaped into something individual and, like the shells lined up on the deck, achingly beautiful. On the moving, breathing ocean.